When you cross a border into New England in mid-fall, you become aware of a new bite in the air, a hint of cider on the wind. You can be driving north on 1-95 toward New Hampshire or, as we did, you’re following 1-91 through Massachusetts into Vermont on a leisurely loop that takes you from the Green Mountains to the White Mountains to the Atlantic Ocean through this country’s most spectacular version of autumn. 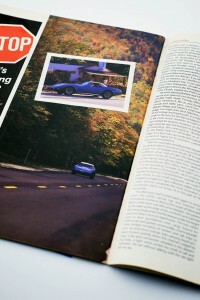 My husband and I left our little Toyota in the parking lot of Hilltop Chevrolet in Somersworth, New Hampshire, and were presented with the car for our trip: an October-sky-blue 1975 L82 Stingray convertible with a 350 engine and four-speed transmission. It was Charter’s birthday and we were about to celebrate in style. 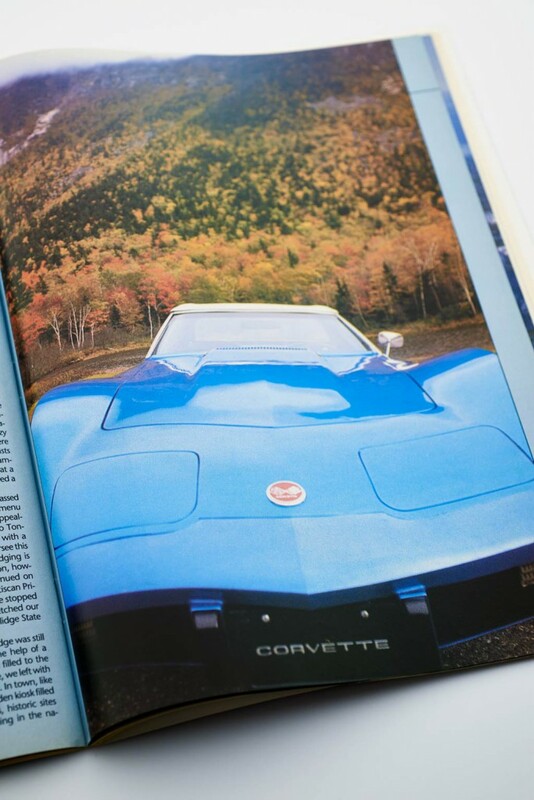 Ron Currier, owner of Hilltop and the sponsor of the Seacoast Corvette Club, had loaned us this car from his fine collection of Corvettes, ranging from the newest models to vintage machines. We were amazed to find that we’d be driving one of the last convertible Stingrays produced. We wouldn’t simply get into this car, we’d put it on! As the engine almost growled in anticipation, we set out. The day was mild and brilliantly sunny, but we packed an extra sweater knowing that the New England adage is always true: if you don’t like the weather, wait a few minutes. And sure enough, in three days we drove through every type of weather the region has to offer at this time of year, from bright sunshine to showers to mountain mists and even a brief morning snow squall in the high country. We left Interstate 91 at Brattleboro and headed west on Route 9 toward Wilmington. We purposely avoided traveling on a weekend because there would be much less traffic and the inns and restaurants wouldn’t be completely full. Still, we had booked our lodgings well in advance because “leaf peeping season” is one of New England’s busiest times. The Vermont Fall Foliage Hotline had informed us that the leaves were taking on good color in the south and were reaching peak in the north, so we were able to follow fall’s progress as we traveled. Everyone has a way to make a trip personal. Charter and I invariably search out the small museums that help define the character of a place. And we talk to everybody. One of our favorite spots to talk — and listen — is a local diner. In West Brattleboro, we stopped at the Molly Stark Coffee Shop and Diner, sat at the counter, and ordered the breakfast special. When finished our second cups of excellent coffee and went out to the sidewalk, our blue Stingray had drawn an admiring cluster of passersby. Sinuous Route 100 would take us north from Wilmington, but we continued on Route 9 west to Bennington for a visit to the Bennington Museum where we spent more than an hour wandering among the museum’s wonderfully various collection of paintings, glass and furniture. The centerpiece a large body of the work of one of America’s foremost primitive painters. Grandma Moses’ genius is on display in oil, tapestry and decorated furniture. A reconstructed schoolhouse holds her memorabilia, from photos to paintboxes to the formal dresses she wore to receive the accolades of queens and presidents. Up Route 7 in Arlington there’s a house full of Norman Rockwell prints and maybe the only gallery in the world where the artist’s subjects are now the tour guides. But we opted instead for a look around at the famous Bennington Potters’ wares and lunch on the terrace of the nearby Brasserie. We ate hearty hot sandwiches with an international flavor, then headed back to Wilmington. Route 100 winds through valleys past small farms with their distinctive red barns and dairy cows scattered on the hillsides; past maple sugarhouses and antique shops; past little rivers that flashed alongside our car before disappearing into the forest We took our time because this is not scenery you want to rush through. 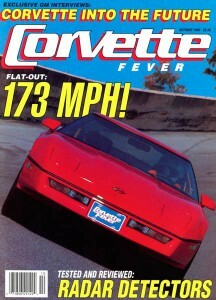 It was pleasure enough for me to shift our Corvette through the sharp turns and accelerate out of them up the steepening terrain along the edge of the Green Mountain National Forest. The mountains, hunched under their crazy quilts of maple, beech, silver birch and tamarack, were folded and buckled into existence by what geologists think was the closing of an ancient sea. Only Lake Champlain remains as witness to that time. We stopped at a roadside waterfall and watched for a while as it carved a white plume in the boney flank of a hill. At a bend in the road at South Londonderry, we passed the Three Clock Inn. The Inn offers a European menu and a surprisingly extensive wine list. Especially appealing are the appetizers of Pate Maison and Vitello Tonnato (a superb combination of cold sliced veal with a tuna sauce). Heinrich and Frances Tschernitz oversee this intimate and comfortable restaurant where lodging is also available for the weary. It was still afternoon, however, on the first day of this trip, so we continued on through Weston with its craft shops and Franciscan Priory to Ludlow, Tyson and Plymouth where we stopped at the birthplace of Calvin Coolidge and stretched our legs under stands of yellowing beech in Coolidge State Park. The Old Hotel Antiques shop in Stockbridge was still open for the foliage season, albeit with the help of a hefty woodstove. Two floors of rooms are filled to the rafters. Mindful of our limited storage space, we left with just a hard-to-find part for our old oil lamp. In town, like every town in the region, we noted a wooden kiosk filled with brochures detailing shops and inns, historic sites and areas for hiking, camping and fishing in the national forests. 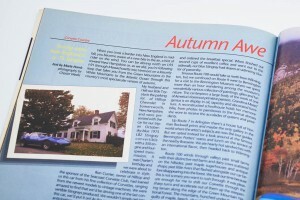 Tourist information is thorough and plentiful and always easy to find all over New England. Looking for a place to stop for a snack, we turned off Route 100 onto a small side road a few miles north of Granville. The tiny town of Warren has one of the most unique country stores we’ve seen. We passed the covered bridge that crosses a river to Lincoln Gap and pulled up in front of the Warren Store. Walking up the steps of a wooden porch, where benches offer a place to watch the world go by, we found all manner of Vermont products from syrup to maple sugar to aged cheese; baskets of local apples and cider, bags of beans and grains, racks of domestic and imported wines. The smell of baking took us out back where we bought an enormous chocolate chip cookie and a cranberry muffin still warm from the oven. Upstairs were rooms of crafts and clothing that had been collected from all over the U.S. and throughout Africa and South America. Warren Village also offers the traveler an art gallery, a local pottery and several inns. Waitsfield is the next town north, and the 1824 House Inn was our first night’s destination. When we turned into the driveway Joyce Newton was expecting us. Red and orange leaves blew across the lawn under the maples and huge pumpkins flanked the en¬trance. This two story, 10-gabled extended farmhouse is an authentic piece of Vermont history. It has been elegantly converted to accommodate guests, with antique and period furniture filling the rooms. Joyce brought us through the living room and upstairs to our room — one of six, all with private baths — which was furnished with an imposing armoire, a writing table and easy chairs, and a quilt-covered bed. We unpacked and walked outdoors, across the meadow to a secluded swimming hole in the Mad River. Nick Newton loaned us fishing poles and his “sure-fire” trout lure; we spent the last hour of daylight on a big flat rock angling in the blue-brown eddies, not much caring whether or not we caught a fish. The river’s surface shattered the reds and yellows of the trees into a watery, Cubist landscape. Curled in the lap of the Sugarbush ski area, Waitsfield offers an array of restaurants. We settled on a little bistro called Chez Henri tucked in a cozy cellar beside a waterfall in Sugarbush Village. We were delighted to discover that we could play a game of boules (a French version of lawn bowling) under a grape arbor before settling down to a perfectly prepared French meal and a delightful sampling of little-known wines chosen by Monsieur Henri. The escargots were drenched in butter and garlic, crusty bread was brought by the loaf, the duck with peppercorns was superb. And Charter’s airy lemon custard pie arrived at the table sporting a birthday candle. After dinner we accepted an invitation to dance in the adjoining disco, and returned to find chocolates on our pillows. Cool Vermont air deepened our sleep. Joyce and Nick Newton served a magnificent breakfast to their guests in the dining room under a Venetian glass chandelier. The orange juice was fresh, the stewed fruit swam in heavy cream. Joyce gave us a choice of ham crepes or oatmeal souffle, so of course we had to sample both. Over coffee we chatted with the Newtons as their daughter, trailed by her retriever puppy, dashed through the kitchen on her way to the school bus. A phone call sent Nick out the door to help a neighbor with his roof. The man next to us from New Jersey spread out his map and asked us the best route to Franconia Notch. There’s no modern motel that can compete with this combination of luxury and conviviality. The 1824 House is a reminder of what hostelry used to mean. With some reluctance we set out on our journey, promising to return. We drove through a shower and alongside a small, perfect rainbow that began and ended in a field of brown, rattling corn. It seemed like a benediction. Route 100 continues into Vermont’s Northeast Kingdom following little rivers through old mill towns toward Canada. The countryside is gentler here and the trees, so dramatic at close range, meld into softer shades of rose and purple. If you have the time to explore, go north for a while and choose any of the roads across to New Hampshire. You’ll find pumpkins by the hundreds piled on wagons by the road, orchards of Macs and Cortland apples ready to pick, working cider mills and maple sugar factories. You might even happen on a country fair where youngsters show their prize pigs and great draft horses pull stone boats to prove their strength. We turned the Stingray east on Route 100B to Route 2. Even though we had been well fortified at the Newton’s, we couldn’t resist a stop at Rainbow Sweets in Marshfield Village. This tiny bakery and cafe has the most delicious array of tortes and pastries we’ve tasted, and because owners Bill Teacosky and Patricia Halloran will ship their delicacies, we indulged ourselves in an Engadiner Nusstorte and a Linzer-torte to meet us at home. We crossed the street for a walk through the Fairbanks Museum, a gift to St. Jonsbury from the Fairbanks Scale Company which manufactures its reknowned scales in the city to this day. The massive stone building houses a planetarium, a gallery of stuffed moose and bear and deer, case upon case of birds and fish, carved wooden boat models, Indian artifacts, and tools of the trades of farriers and carpenters and smiths and loggers. New England’s rural past is wonderfully preserved under this roof as it is in pocket museums in almost every town and village in the region. Crossing the border into New Hampshire, we imagined that our patient Stingray leapt at the chance to charge down Interstate 93. We felt the stirrings of power to spare as we covered the distance to the Bethlehem exit in no time and headed into the White Mountains. If we’d taken the route we had outlined for our breakfast companions, we would have stayed on the highway to Franconia Notch, passing beneath New Hampshire’s stern Old Man of the Mountain and stopped to see the stunning waterfall called The Flume which hurtles 800 feet down walls of granite into a narrow gorge. From The Notch, we would have taken the Ashland exit and charted another route to the sea. As it was, we set our sights on the Mount Washington Hotel and Crawford Notch on Route 302. The forests of New Hampshire have a more rugged aspect than those in the Green Mountains as they climb the precipitous granite slopes to the treeline. Enormous upheavals lifted these mountains 350 million years ago, and the valley was roughly carved by retreating glaciers. The summit of Mt. Washington boasts the highest winds recorded in the United States and, as if by way of warning, our view of fall’s blazing was cooled by a brief spitting rain and a gusty wind that tossed hmbfuls of leaves across the highway. Under the gray, threatening sky, the leaves took on a gold glow. The Stingray held the wet road without so much as a tremor, and we thoroughly enjoyed piloting it into the sharp turns. To round a corner and encounter the Mount Washington Hotel, huge and white under a scarlet roof against an azure backdrop, is an amazing experience. It’s set on a 2,600-acre private preserve in Bretton Woods in New Hampshire’s imposing Presidential Range, and is one of America’s legendary grand resorts. Built by industrialist Joseph Stickney and completed in 1902, the grand hotel was innovative for its time. It featured a steel superstructure, complicated heating and plumbing systems, a private telephone system and a power plant that served reliably for over 50 years. The work of countless Italian wood and stone craftsmen is still in evidence today. Of course, the twentieth century has left its mark as well. The rooms are equipped with all the modern conveniences, several restaurants offer live entertainment throughout the seasons, and guests can make use of facilities from a library to a championship golf course, to tennis courts, pools and saunas. We wound up the long drive and parked beside a terraced lawn. Picturing ourselves in elegant evening dress, we wandered through the vast carpeted halls looking at photographs of the historic World Monetary Fund Conference held here in 1944. A gracious porch offered deep wicker chairs for yet another vantage of the autumn slopes. Lunch was a disappointing affair, but we’d be back in the spring and were willing to try the Stickney Room again. For sheer inspiration and a glimpse of an era long past, the Mount Washington Hotel is unparalleled. Unlike driving in the ample valleys of Vermont, passage through the White Mountains recalls the rigors of the first settlers’ attempts to find passage from the coast to the headwaters of the Connecticut River. Now Route 302 threads Crawford Notch between mountains that seem to echo Indian legends. We accelerated through curves under arches of yellow birches, dropping toward New Hampshire’s Lakes Region. Thirty-nine towns and three cities border forest ponds and lakes in this part of the state, offering endless opportunities for detours. If you find yourself in Sandwich, for instance, on Columbus Day, you’ll want to visit the Sandwich Fair, in our opinion the best of its kind in New Hampshire. Or take a cruise on the Mt. Washington down Lake Winnepesaukee, tour Castle in the Clouds, explore the Polar Caves. We were passing Bartlett and Mt. Attitash, keeping our eyes open for our shortcut. If you enjoy acres of outlet malls, North Conway offers them in abundance. However if, like us, you’d prefer to avoid the crowds and traffic jams, you’ll turn right just past Attitash Village and follow a small road to Cathedral Ledge. Turn right onto West Side Drive, pick up Route 16 at Conway and head south. In a mile or two you’ll come to the turn for the Kancamagus Highway, one of the most scenic stretches of road in the state. It was created for tourism, however, so, though the foliage is spectacular, the bumper-to-bumper drive can be frustrating. We continued on 16 where the sign for the Darby Field Inn reminded us of other evenings. It’s a few miles up a wide dirt road and we recommend it highly for its seclusion, cuisine and gracious accommodations. With the mountains receding in the rearview mirror, we skirted Lake Chocorua on our way to Portsmouth. A right turn at Ossipee onto Route 28 brought us to Wolfeboro at an inlet of Lake Winnipesaukee. With Halloween not far off, front yards were peopled with stuffed figures and ghosts blew from skeletal trees. We followed Route 28 to Alton, then south on Route 11 to the Spaulding Turnpike. If we hadn’t promised ourselves dinner in Portsmouth, we’d certainly have stopped at Johnny’s World Kitchen outside of Rochester where, in one small restaurant, we could have indulged our taste for Cajun, Mexican, Italian or French cuisine. Johnny’s proposes the most innovative and inexpensive menu we know of in this part of New Hampshire. The afternoon had turned warm again so we put down the white canvas top and breezed into Portsmouth in time to drive to the ocean at Newcastle Beach while there was still some daylight. We parked by the water at the edge of the continent and watched skimming sloops enter the Piscataqua under the bright gaze and deep voice of a lighthouse. The river, which used to bear gundalows with cargo bound for Portsmouth and upriver communities, chums beneath three bridges bringing oil tankers and salt ships to port. An enormous orange ship carrying liquid propane moved carefully down the channel nudged by tugs. Gulls and cormorants wheeled in the deepening dusk. A light wind carried the smell of salt and seaweed. We sat without talking until the last light left the sky. The only drawback to visiting Portsmouth for a brief time is the frustration you’ll feel at how much you’ve missed. The historic port city includes a restaurant for every taste, inns and bed and breakfasts, a meticulously restored early American village — Strawbery Banke — that is a living museum of architecture and artisans. There are galleries, craft shops, historic buildings and cruises that can take you through the autumn harbor or out into the Atlantic to search for whales. The Albacore, one of the earliest atomic submarines, is permanently berthed off Market Street for a truly unique small museum discovery. We’ve lived in this area for years, but it was fun to ramble in Portsmouth like tourists, looking with fresh eyes at 1 7th century graveyards whose stones speak of sailors and settlers; at the North Church in Market Square, designed by architect Christopher Wren; at the Bullfinch library; at the John Paul Jones house and, next door, the old Rockingham Hotel, built by millionaire brewer Frank Jones. Now this brick behemoth houses spacious condominiums and The Library restaurant. We walked down Court Street to inquire about room rates at the Sise Inn, a Victorian mansion restored to fill its new role as hostess to the modern traveler. Around the corner, a couple of blocks up the street on Richards Avenue, we were shown around the Leighton Inn’s Federal rooms with characteristic painted pine floors and period wallpapers. Frost has not yet bitten the annual flowers in their backyard garden and breakfast will be served on a sunny side porch overlooking the perennial garden. Portsmouth offers many more places to stay including the Martin Hill Inn, The Inn at Christian Shores, The Inn at Strawbery Banke, and a new Sheraton hotel (with an exceptionally good dining room), not to mention a cluster of predictable motels at the traffic circle where Interstate 95 leads in and out of the seacoast. Seeing a number of hand-carved No Vacancy signs, we noted again that the choice lodgings at this time of year would need to be booked ahead. Contemporary Portsmouth keeps up with culinary tastes. You may be in the mood for sushi or quesadillas, szechuan garlic chicken or Maine lobster, spanikopita or fresh sole Florentine. We challenge you to find Portsmouth’s restaurants lacking any but Indian cuisine! We had a fine meal at Lila’s on Penhallow Street, took in some jazz at The Press Room, and woke to a brilliant morning. After breakfast at the Cafe Brioche in Market Square we spent a few hours on a fall foliage cruise in Portsmouth Harbour. Having seen autumn speed past from the unique perspective of our sporty Corvette, we now watched it reflected in the glass of the water. We shared the deck of the Heritage with visitors from all over the country as well as a handful of seacoast folks who couldn’t resist the annual display. As we meandered upriver, Skipper Walter Dunfey entertained us with historical anecdotes that gave our cruise added flair. We disembarked at the Oar House Dock and strolled over to the Depot for a leisurely lunch, topping off our birthday present to ourselves with homemade carrot cake. We ordered a split of champagne, lifted our glasses and proposed a toast to fall in New England and the Stingray that chauffeured us through it in such style.